Please join us for a special meeting focused on networking and community building! We’ve all heard the adage, its not what you know, but who you know that matters. How does this translate to the RVA food community? Too often we hear that saying through the lens of how it benefits us as individuals – what if we looked at it differently? What if in every network interaction we tried to think of who we could connect them to that would in turn add value to THEIR network? Come meet members of our local food community, share the story of your business with other members of the community, and add value to your own network. The local food community is a place for collaboration and connection. Join us to learn some basic steps to strengthen your network and ultimately the local food community as a whole. We’ll taste samples of UnMoo’s plant-based cheeses and enjoy coffee from the Cafe at St. Stephen’s. Thanks to C&F Bank for being our meeting sponsor! **Real Local RVA meetings are open to both members and those interested in supporting the local food system. Meetings are free, we just ask that you register! 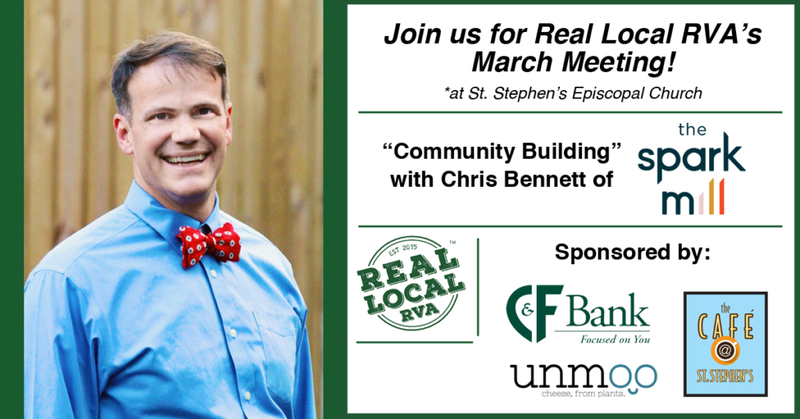 Chris Bennett is a consultant and facilitator with The Spark Mill, a Richmond-based strategic planning & consulting firm. Prior to The Spark Mill, Chris spent 15 years in faith-based nonprofit leadership with small medium and large congregations of the United Methodist Church. Chris is passionate about big ideas that create lasting positive impact. When he’s not working with groups to develop creative solutions, Chris, his wife (Jill), and their two boys (Henry and Nicholas) are attempting to visit or camp at all the state parks in Virginia.